My experiences have led me to believe that nearly everyone has a great story. This belief was born out when I looked more closely into the experiences of long time clients Linda Louise and Linda Ann Schulte. The Schulte family has always been smitten with the Silky Terrier breed of dog and has had several over the years, including their father’s Gigi, who I worked with before and after he passed away in 2003. The Lindas, as I will refer to them, have had many communication sessions with their dogs over the years. Our introduction was in 2000, when I consulted with them and their first rescue, a ten year old Silky Terrier named Raymond, a prior show dog who had fallen on unbelievably hard times. When they adopted him from the Orange County shelter he was in pitiful shape, but his fortunes were about to change dramatically. This little crestfallen Silky now found himself receiving the best of care, along with lots of support and love, and he became the king of the house. They also shared their home with Clio ,Mouse, both Border Collies, another show Silky named Albert, and Charlie, a five year old male Silky. 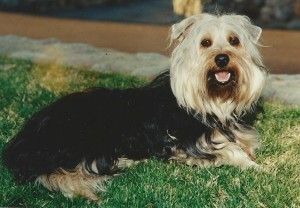 The latter, a small performance powerhouse and “renaissance” dog, represented the best of the breed. Linda Louise was an avid show person and competitor. Linda Ann liked the activities as well, but it is Linda Louise who holds the competitive streak in the family and in Charlie she found her dream dog. Linda Ann worked with him in obedience, but Linda Louise took on the other disciplines. He excelled at everything: obedience, agility, conformation, herding, and go to the ground (track rats at end of a tunnel). Linda liked to win and Charlie liked to win for Linda. …BN: What have you come in to do? Charlie: To be noticed, to be number one, to PERFORM, PERFORM. I love, love, love APPLAUSE. I love attention, I do, I do, I do. BN: Do you understand Raymond is staying because he needs a home? Charlie: Yes, yes. I really, really like Raymond! He is a “show dog” like me. He is very smart and he is a very very very good companion now. Very. I enjoy having another small dog to play and to stay home with when everyone is out out out. BN: Can you help take care of Raymond? The Lindas made sure their dogs each got their needs met (see list below), but Mouse played a crucial role in keeping the pack dynamics smoothed out in the home. When she passed, the group dynamics suffered. Sadly, Raymond’s health problems got the better of him and he passed away six months after being adopted. 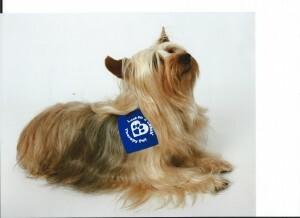 However, his legacy lived on as he became the catalyst for them to become involved with Silky Terrier Rescue. I had not known about the breed before I met Raymond and though I could tell Raymond had been a magnificent little show dog, his run down body and depressed emotional state didn’t portray the breed accurately anymore. 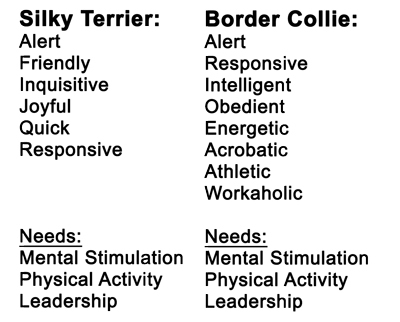 Border Collies are larger dogs and considered the brains of the working breeds. 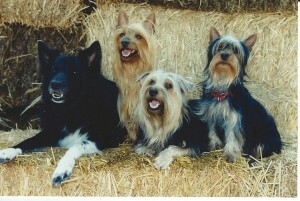 Silky terriers are much smaller and, at first glance, may be mistaken for a Yorkshire terrier. Raymond and Charlie were my first Silky encounters. Why did the Lindas have such different breeds under one roof? What exactly was a Silky? How did the dogs get along? Did they form a little pack or were they divided into separate ones according to their breed preferences? I found this particular juxtaposition of large and small dogs under one roof puzzling and interesting. As you can see both breeds are similar in temperament. And both breeds need a leader (human in charge providing them direction) and a job to do so that they do not become destructive. Mystery solved! Indeed, the Lindas had it all figured out. Danny: I HAVE COME TO BE SPECIAL, TO BE UNIQUE. TO BE ADMIRED. I teach love and companionship I am the PERFECT COMPANION. He also mentioned he wanted to be like Charlie, his role model. Within a few months Danny, now three years old, had turned into a people lover who always wanted to be the center of attention, even competing for attention and position with Charlie. He thrived with the Lindas and had no qualms in declaring he and Charlie were equal (! ), even relegating Charlie to number two position. Charlie, a very secure dog, didn’t challenge him and relied on Mouse and the Lindas to keep Danny in check. After Mouse passed, and in spite of efforts to keep him in line, Danny showed a dominant, aggressive behavior with Charlie and the other dogs. They wanted to feel special too, and weren’t as accommodating as Charlie to his self appointed position of power, might and specialness. With age he got even less tolerant and had to be kept apart from the others so peace could be maintained in the house. His ongoing disrespect of the other dogs created tension in the pack until he crossed over at seventeen. Tazz, another Silky, followed Danny’s adoption. 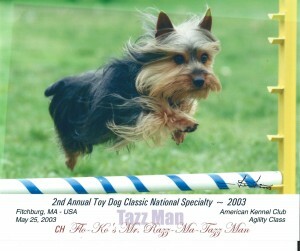 Tazz was a lovely show dog that was signed over to the Lindas by the breeder when he got his championship title. He behaved in a submissive manner except in the show ring, where he knew how to strut his stuff. Tazz had a sensitive and refined soul and found commanding respect from other dogs to be challenging. He was a wise one, and on going back to his transcripts, I feel I would have liked to spend more time with him. BN: What are you learning? Tazz: Not much. I am a teacher, not a student. A teacher. A teacher. A teacher. BN: What will you be teaching your people? Tazz: Refined soul in dog body. Refined, refined, REFINED. BN: Would you like to join Charlie and Danny in agility and obedience when you are done in the show ring? Tazz: Don’t know yet. Do I need obedience? Linda Louise agreed with him, he didn’t need to pursue obedience. Tazz went on to earn titles in conformation and agility, but never competed in obedience. Wise Tazz, petulant Danny, and generous Border Collie mother figure and boss of everyone, Mouse, have passed away and the current 2016 line up is as follows: J.P. (short for Jean Paul), a female Border Collie, came into their lives in 2011; Casey, a female Silky puppy who came to them though Silky Terrier Rescue in 2013; and last, but certainly not least, the bigger than life young male show Silky, Rocky, arrived in March 2015. A mature five year old JP in a consult clearly declined to raise or teach the cocky young Rocky his manners. That was a responsibility she squarely delegated to the Lindas. A Mouse, mother figure Border collie, she would not be! The Lindas no longer take part in competitive activities because they are retired and also slowing down, but they know their dogs need to feel useful. Recently, in the spirit of supporting the community at large and providing a job for their dogs, J.P, Casey, and young Rocky have become Certified Therapy Dogs with the Love on a Leash organization in Oceanside, California. Casey, the only Silky girl in the family, has racked up four hundred hours of service and earned the first Distinguished Therapy Dog title for her breed. There is a very interesting sideline story about J.P., the Border Collie. She appears to be connected to the Border Collies that came before Mouse. She confirmed with a doggy chuckle and delight that she was Clio (pronounced Clue) the female Border Collie that came before Mouse. Clio (1984) wouldn’t urinate outside her yard, which was a problem for a dog taken to shows and events. At that time, the Lindas consulted with animal communicator Samantha Khury, who helped Clio overcome her issue. It so happens that J.P., a year old in 2011, had the very same problem, which we worked through with Flower Essences and lots of consistent encouragement. Linda Louise and Linda Ann hid behind bushes and buildings so J.P. wouldn’t be seen while urinating and, eventually, she grew out of it. Furthermore, J.P. has the same mannerisms as Clio. She is very noise sensitive and loves to lay in the bathroom behind the toilet, in the same bathroom, in the same house. Her looks and markings are identical except for the coloring. J.P. is black and white, while Clio was tricolored. Clio loved to play ball, but in a consult with J.P., she communicated that she is beyond ball playing in this life. Instead, she prefers people and her therapy dog work. Each of the Lindas’ dogs burst with personality and eagerness to engage in their life with them. 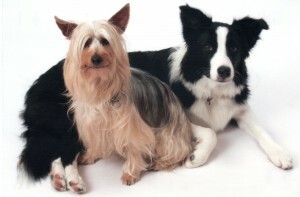 It isn’t like they don’t have their challenges, but they keep true to the fundamental needs of each breed: to provide each dog with good leadership and a job that engages their intelligence and physical abilities, as well as occasional animal communication sessions to be clear about the needs of each individual. I would like to end this blog with a small tribute to Gigi, who brought so much joy and companionship to Gordon Schulte, Linda Ann’s father, who lived alone after his wife had been moved to an Alzheimers facility. 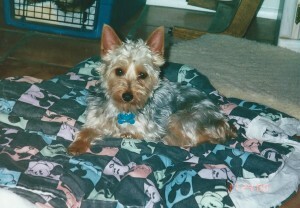 He found Gigi on the internet, at approximately one year old, through Silky Terrier Rescue. When he saw her picture, the connection was immediate and he couldn’t get her out of his mind. After a few days, he made the necessary arrangements to adopt her and pick her up in another city. Gigi: I am so pleased to be here, to be loved, to be cherished. So pleased to be IMPORTANT. I love to be important, I love to take care of, I love to be taken care of. I AM A PERFECT DOG. I AM, IAM, I AM A PERFECT DOG. I DO NOT HAVE ANY FLAWS, I AM PERFECT. I am so willing, so willing. I am so generous. I am so, so, so grateful to be heard. To be able to express my gratitude to have been saved, saved, saved. I was not, not in a happy home. I was in a home full of fighting, full of abuse, full of lies, lies, and lies. All the time lies. I am a very honest dog, I NEVER LIE. I was constantly accused, accused, accused of lying. Lying like my person. I hate lies. Gigi had grown up to feel insecure and lacked confidence. Her trust in men needed mending as well. This all changed when she came to live with Gordon. 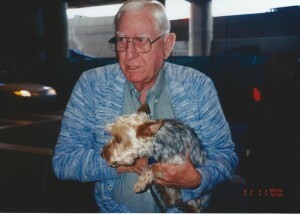 A great little dog found a man that loved dogs, and especially her breed, and allowed her to shine. In good Silky mode, she loved to show off and be seen. She wanted Gordon to take her everywhere and show her off to people. Of course this got him motivated to get out of the house and casually socialize with his new little companion. Gigi two weeks with Gordon. Gigi embraced her new home with John and Cindy and is still with us at the venerable age of seventeen. Gordon Schulte, who raised his children to be dedicated animal lovers, didn’t have a thing to worry about concerning his beloved Gigi. P.S. If you are wondering, like I did for a long time, how Linda Ann and Linda Louise got the same last name. 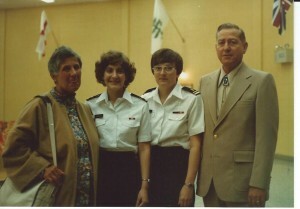 Linda Louise explained that the Schulte’s adopted her into their family in 1974 after she had met Linda Ann while they were both working at a Naval hospital. Linda Louise was a Navy Corpsman and Linda Ann was a Navy Nurse. Eleanor, Linda Ann, Linda Louise and Gordon Schulte. As always I am grateful for Phyllis McLaughlin’s editing skills. What a great story, thanks for sending. Your comments are appreciated! Glad you liked it. Thank you for sharing these stories. It’s so nice to hear about the dogs and what they are thinking and how they are doing. Thank you, Marsha. I love writing about the animals and their people. The Lindas have been long time friends from our Navy days. They treat their dogs like beloved children. They work well with all types of dogs. They had my adorable and much loved Labrador, Blazer, for several months training her into a very well behaved one-year old. I have said, since I’ve known them, that when I die (if I was a believer in reincarnation) I want to come back as a Schulte dog. What a great way to live!